Though it was revealed in an unlikely manner, we now know the general release window for Modern Warfare 2's first DLC map pack. Though you might have to wait until October 4 for Modern Warfare 2's new trailer, some information about the game's first map pack has been revealed to whet your appetite until then. Of the two planned DLC map packs, Shacknews reports that the first is planned for Spring 2010. How did they come by this guarded information? From the packaging of some Monster Energy Drink. 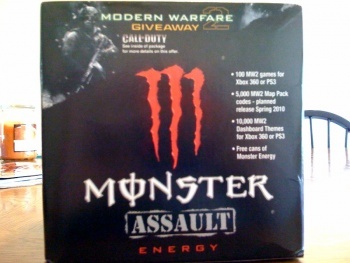 You see, Activision and Monster have teamed up for a Modern Warfare 2 themed giveaway. Printed on a package of Monster sent to Shacknews, which details the prizes for the giveaway, is: "5000 MW2 map pack codes - planned release Spring 2010." Talk about an unorthodox reveal. The other prizes in the contest include 100 copies of Modern Warfare 2, 10,000 Modern Warfare 2 dashboard themes, and free cans of Monster Energy Drink. DLC map packs being planned before the release of Modern Warfare 2 does not surprise me at all; DLC is now a huge part of the industry and can extend the life of a game, especially when it comes to first-person shooters. Many companies are planning to support their products with DLC for years, such as BioWare with Dragon Age: Origins. DLC is a great way to get consumers to hang onto their games, rather than trading them in after a week. Usually, DLC is a boon to the game industry, allowing developers and publishers to earn a little extra dough, and to gamers that are able to get more out of a single release. Just in case you aren't aware of what might become one of the biggest games of all time, Modern Warfare 2 will be released on November 10, 2009.